Oral Surgeon Jack Lignelli was determined that his Bear Fever bear be “the best.” Many Bear Fever fans agree that the students at BASH met the challenge. Check out the images on “Doc's” tie, the stethoscope (which was a real challenge for Geoff Quinter), and the toothbrush in his back pocket. 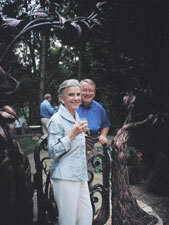 Jack Lignelli, local oral surgeon, looks delighted to attend Nancy Boyer's gathering following the July 2006, Garden Tour. Can you find a more lovely, relaxing spot in the entire universe? 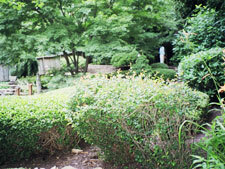 The Lignelli gardens offer a respite in typical Japanese style. 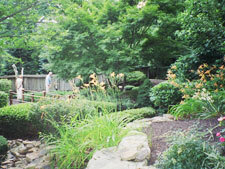 Gretchen and Jake Lea admire the beautiful Japanese garden of Linda and Jack Lignelli, oral surgeon. Linda shares that Jack himself planted every specimen in their garden following developed by Dave Horn. 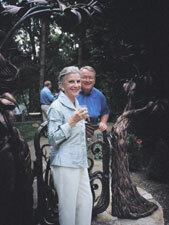 Oral Surgeon Jack Lignelli stands “ready at the gate” with owner Nancy Boyer following the Sister Cities July 8, 2006, Garden Tour. Mrs. Boyer commissioned the sculpture and welcomed the community to see her new stunning piece of art during the Garden Tour. 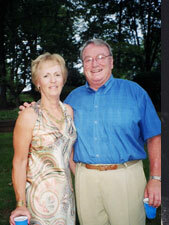 Pottstown Oral and Maxillofacial Surgery Associates, Inc. When I decided to become part of the Bear Fever experience in Boyertown, I had no idea what I was getting into. 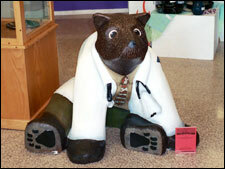 The only knowledge I had of Bear Fever was that businesses were buying bears and painting them By becoming part of the Adopt-a-Bear program, I had the privilege of discovering the people behind the scenes of a Bear Fever bear. As a sponsor, Dr. Lignelli requested that students decorate his bear, and he met with them to plan the design. 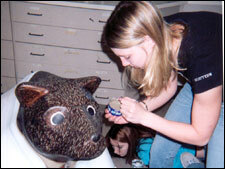 The lead artist of this bear was Steve Fegely, an art teacher at Boyertown Junior High East. Mr. Fegely became involved in the Bear Fever project because he was “personally requested by Shanea Wisler,” a former student of his. Mr. Fegely says that his goal in this project is “to work with some former students of mine and see how they’ve matured artistically in the three years since I’ve seen them.” The students he is referring to are Jaci Hardgrove, Kelly Coughlin, and Sam Terkowski, members of Mrs. Wagner’s Painting I class at the high school. When I walked into Mrs. Wagner’s class during second period on April 13, 2005, I was pleasantly surprised to see all three students working diligently on their designated bear. 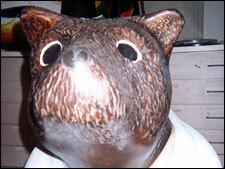 The bear wore a white lab coat, green pants, and a tie decorated by images of teeth. Its fur was given texture by layering thousands of different colored paint strokes. Kelly said that another reason the fur was hard was “figuring out how to mix the colors correctly to get the previous shade of brown.” They tried to prevent having to make more paint by putting the leftover paint in a container, but the acrylic paint would dry quickly. I learned that Boyertown is changing into a community that everyone is going to love. We have people like Dr. Lignelli, Mr. Fegely, Sam Terkowski, Jaci Hardgrove, and Kelly Coughlin who want to make a difference in our small, but mighty, community. People like these are striving to bring the community together by connecting generations; this type of bond can be a powerful one. With people like these, we can build a better Boyertown.